A short-handed goal with two minutes remaining from Cardiff Devils’ Captain Jake Morissette earnt the Elite League table toppers a 6-5 victory over the Genting Casino Coventry Blaze at the Viola Arena. 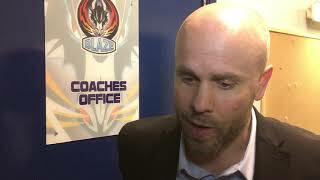 Blaze travelled to South Wales without back-up goalie Jordan Hedley and depth forward Dillon Lawrence through injury, whilst defenceman Justin Hache sat out the second game of his two suspension. Christian “Chico” Cole from the NIHL’s Solent Devils came into the line-up to cover for Hedley whilst Swedish forward Thom Flodqvist returned following illness. Following recent defensive frailties, Coventry began with a clear agenda to better protect their goalie Matt Hackett and after Shawn Pauly put them 0-1 up (8.05) after twenty minutes, it looked as though the game plan was working. However, the second become much more of a familiar story for Blaze as they began to trade chances, and goals with their opponent. Four-on-four Cardiff got themselves level with Mike Hedden capitalising on a turnover for 1-1 at 22.18. Extending his away point-scoring streak to 12 games at 22.47, the Elite League’s top point-scorer Ben Lake made it 1-2 before the Canadian turned provider for Tim Crowder who finished close-in for 1-3 on 23.10. 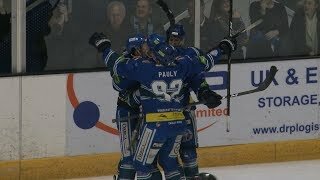 A double from last years’ Elite League player of the year Joey Martin tied things up again (24.52 and on the powerplay at 35.08). Again, on the man advantage, Gleason Fournier with a long-range shot put Cardiff ahead for the first time (37.49). Blaze made it 4-4 through their Man of the Match Lake, scoring his second and 28th of the Elite League season at 38.55. The post-game award his 12th of the season, breaking the club record for most Man of the Match awards for an out-skater in a single campaign. Cardiff’s MVP on the night, Hedden doubled his tally at 44.12, but Blaze again responded through Chris Joyaux on the powerplay at 45.21. With a late powerplay opportunity to win the game, Coventry were left disappointed as Morissette broke and scored shorthanded (57.59) to win it for his side by a final score of 6-5.